Use your hands to massage the kale with the dressing for a solid 3 minutes until the kale has softened slightly. When I say “massage” I literally mean massage, people. Take handfuls of kale and rub them between your hands. It’s kinda weird and gross, but it will be worth it. DO NOT SKIP THIS STEP. Set your kale aside to marinate for 15 minutes. While the kale is marinating, toast your pine nuts. Heat a small saucepan over medium heat. (Do not put any oil in the pan!) When hot, add the pine nuts. Toast for 2-3 minutes, shaking the pan periodically, until the nuts are golden brown and fragrant. Remove from the pan and let cool to room temperature. Add the red onion, avocado, half of the strawberries, and half of the pinenuts to the marinated kale. Gently toss and transfer the salad to a serving dish or individual plates. 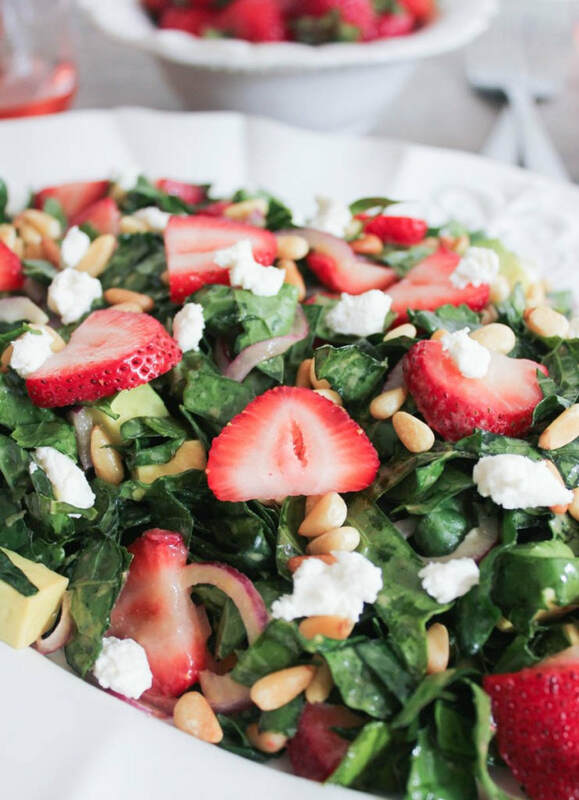 Top with the remaining pine nuts and strawberries, sprinkle with goat cheese, and serve.